How we approach research involving animals, including regulations we follow, our ethical review process and the animal species we use in our research. Research involving animals is fundamentally important in the quest to understand disease mechanisms and to progress medical and scientific research. The University of Bath carries out world-class research in this area which includes various projects using vertebrates, particularly for the development of new therapies for chronic and distressing conditions such as cardiovascular disease, cancer, depression and neurodegenerative disease (for example, Parkinson’s). The University of Bath fully supports the principles of the National Centre for the Replacement, Refinement & Reduction of Animals in Research (NC3Rs) and endorses their ARRIVE guidelines, developed to improve the design and reporting of animal experiments. We make considerable use of other experimental models such as tissue culture and computer modelling but certain properties are shown only by whole animals. In these instances we ensure that animal numbers are kept to the minimum possible to provide credible data and that all procedures are as refined as possible to reduce any possible suffering. For example, although various properties of vascular cells can be studied in tissue culture, the regulation of blood pressure can only be studied in whole animals. On 14 May 2014, the Concordat on Openness on Animal Research in the UK was launched, of which the University of Bath is a signatory; this has 4 commitments with respect to clarity, understanding, communication and reporting and is available on the Understanding Animal Research (UAR) website. Our activities in line with these commitments are reviewed annually. In the UK, research involving living non-human vertebrates is regulated by the Home Office under the Animals (Scientific Procedures) Act 1986 incorporating the EU Directive 2010/63/EU, and all work is carried out under licence. Projects are rigorously reviewed, initially by the local Animal Welfare and Ethical Review Body (AWERB), which includes scientists, vets, animal welfare officers and lay members, and finally by the Home Office Inspectorate (Animals in Science Regulation Unit). This ensures that, for any proposed project, the benefits from the research outweigh any possible discomfort to the animals. Non-technical summaries of all approved project licences are posted on the Home Office website and are available for viewing. 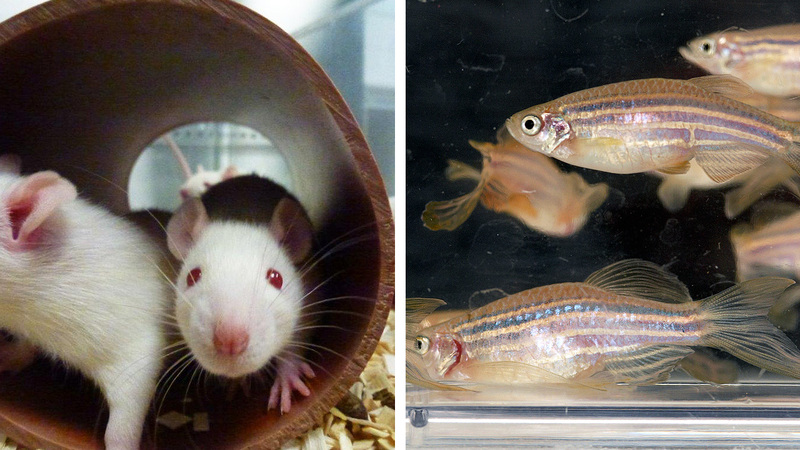 At the University of Bath, we work with a range of animals primarily mice, rats, fish and amphibians. No work on live animals involves the use of dogs, cats, horses or non-human primates and all of our work is scrutinised by a veterinary surgeon, associated with the establishment. Experimental procedures are carefully designed to minimise animal suffering, surgical procedures are always performed under sedation with appropriate pain relief and animals are closely monitored at all times. Because our animals are of prime importance to us, in 2008, the University invested in a new purpose-built animal facility. Thus, our animals are maintained to the highest standard in premises that are open to inspection by the Home Office at any time. We have a dedicated team of health and welfare officers who provide day-to-day care and our veterinary surgeon is on call at all times, should a problem arise. Together, these provide the ultimate conditions for the implementation of modern guidelines on animal health and welfare. Additionally, at the University of Bath, we are involved in a number of conservation projects and field studies. With respect to openness, Section 38 of the Freedom of Information Act 2000 sets out an exemption from the right to access information held by a public body if the release of the information is likely to endanger the physical or mental health or the safety of any individual. Details identifying individual members of staff involved in particular research projects will not, therefore, be disclosed. Nevertheless, statistical details of all scientific procedures performed on living animals are collected from licensees and published annually by the Home Office. Moreover, within the University of Bath, annual reports on all animal research projects are subjected to review by our local AWERB and all work conducted at the University of Bath is subsequently published in scientific journals that are freely available for inspection. See frequently asked questions or facts and figures about our animal research. By investment in our facilities and staff, thus maintaining excellent animal welfare and husbandry, we are confident in our experimental outcomes, ensuring the maximum benefit from our work and, in time, a better future for sufferers of a chronic disease, whether human or non-human.